Pets bring their owners an immeasurable amount of happiness, but they do have accidents that are hard to deal with on carpet and upholstery. Unless the right cleaning products are applied using the proper method, then pet stains will most always reappear. Treatments can fail for a variety of reasons, but a common mistake is applying cleaning solution to a saturated surface that will not accept any additional liquid. The pet stain removal experts at McLaughlin’s Carpet Care in Longmont know the precise steps required to effectively treat each soiled or smelly surface in your home. Type- Unfortunately, cat urine is often harder to remove because it is more concentrated than dog urine. Severity- The strength of a stain is also affected by a pet’s age and gender, their diet and if they are taking certain medications. Amount- If urine seeps down through the carpet pad and permeates the sub-floor, the process of stain removal becomes more complicated. To permanently remove pet stains, every affected area must be detected, otherwise the stains will just reappear over time. A black light inspection will pinpoint all soiled spots that are invisible to our eyes. Getting an accurate assessment of the scope and depth of pet stains is essential to developing an effective solution. 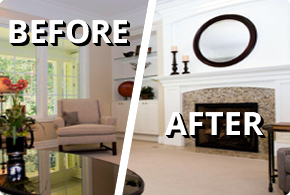 Depending on the findings, we will perform the appropriate method such as light to heavy odor removal treatment, regular to deep cleaning, carpet or pad replacement and even floor sealing. If pet urine has become trapped in the sub-floor, the step of sealing the floor with a special odor barrier is indispensable. Our top goal at McLaughlin’s Carpet Care in Longmont is to assist our customers in making the most effective and affordable decision for a pet stain removal service that will completely restore their home to its clean and fresh state. We our thorough in our inspection, use only the highest-quality non-toxic products and have years of experience so we are confident in our ability to remove the toughest of stains! We service Longmont, Firestone, Frederick, Louisville, Lafayette, Boulder, and most of the Front Range area of Colorado. Contact us today for all your pet stain removal needs!